In Windows 7 and Windows 8, you can create, use, attach & manipulate Virtual Hard Disk Files (VHD’s) as though they are real disks. This allows Virtual PC users to be able to mount their virtual disks within a live Windows installation without the need of booting the virtual PC environment. Right click on Computer > Manage > LHS pane > Disk Management. Select Action tab > Create VHD. Specfiy the location and its size. Once this is done you will see a VHD HBA driver beinginstalled notification. 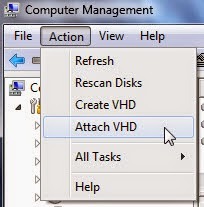 Select Action tab > Attach VHD. Select Action tab > Attach VHD. Specify the location. The system will then mount the VHD file. 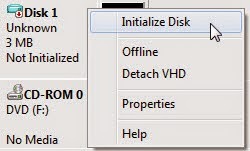 Next right click on the VHD and select Initialize Disk. Select the Partition style > OK. The system will now initialize the disk. 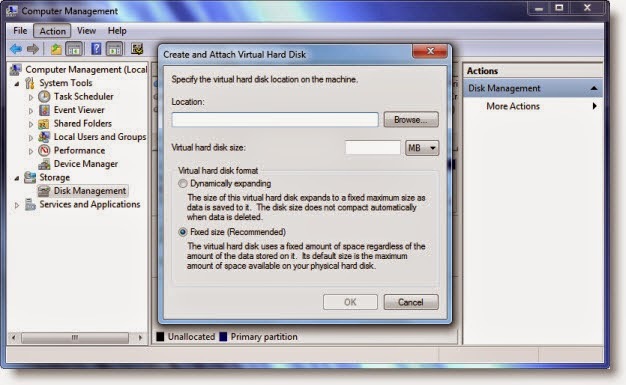 Next right click the unallocated space in the VHD & select New Simple Volume. Follow the instructions. That’s it. Open your explorer and you will see your new VHD.